I'm a big fan of sandwiches, all kind of sandwiches: burgers, french Pan Bagnat, hot dogs, falafels, panini... maybe that's why I love to bake so many kinds of bread..?! 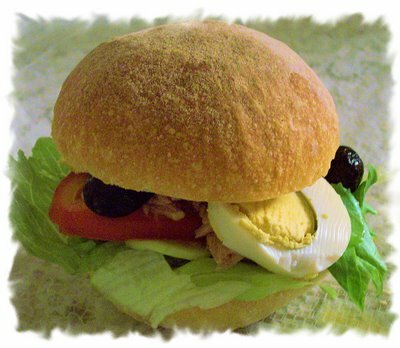 Basically, a Pan Bagnat is the sandwich version of the very famous "Salade Niçoise": a round bread, generally a rustic country bread is cut in 2, rubbed with garlic, moistened ("bathed") with olive oil and filled with "salade niçoise" then wrapped tightly in a towel or a linen and kept in the refrigerator an hour or so before you can eat it. In fact, any kind of bread can be used but to be a real Pan Bagnat, it has to be filled with a real salade nicoise made with sliced fresh vegetables: tomatoes, lettuce, little black olives, cucumber, onions, green peppers, little fresh beans, tuna or anchovy fillets, hard-boiled eggs, olive oil, salt, pepper and basil. I always make my own little crusty round breads with a soft and chewy crumb perfect to soak up this kind of moist and juicy sandwich without getting soggy. 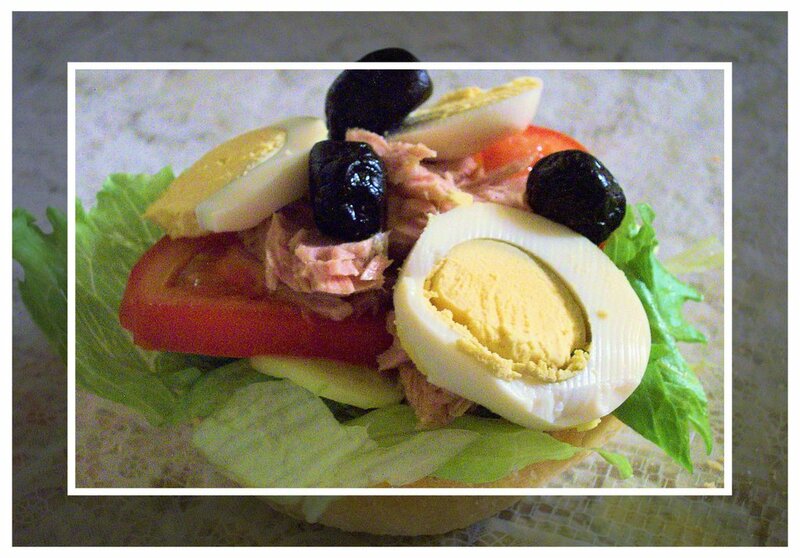 Well, I have to admit that my Pan Bagnat are not the real one because I love to add some sliced pickles and avocado.. and also, a light touch of vinaigrette.. but, hey, they're so yummy!! hey ,est ce qu'Avital serait en train de devenir "internationnale"? Heu... j'en prendrais bien un morceau. Just a little bit! Oh Sandra, they look sooo good!